EUR is losing power due to the weak economic reports in Eurozone such as Factory Orders and Retail Sales in Germany. The support rests at 1. 0501 with resistance at 1.05530 which both lines are above the weekly pivot point at 1.04960. The EMA of 10 is falling down along the descendant channel and it is above EMA of 100 and below the EMA of 200. The RSI is moving on 50 level area, the Stochastic is moving in low ranges and the MACD indicator is in positive territory. The ADX is showing a weak sell signal. The price is above the Ichimoku Cloud and the Chinkou Span. The Tenkan-sen and the Kijun-sen are both showing horizontal trend. 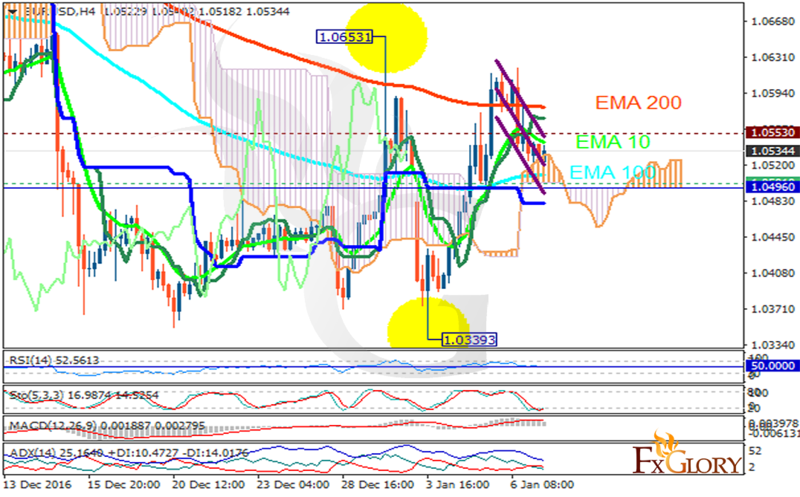 The resistance level breakout will push the pair to higher rates like 1.0650 otherwise, it will drop to 1.045 area.